Have you ever wondered how hospitals mitigate the effects of an earthquake? All facilities should have a solid earthquake safety plan. Safeguarding hospitals is especially vital for the community during the aftermath of an earthquake because there is a sharp increase in demand for medical services. The community will expect the these facilities to provide medical care to the injured as well as help those people who are suffering from the traumatic experience. Below are safety measures that hospitals should take in order to ensure function after an earthquake so that they can deliver quality care. Many patients will not be able to protect themselves during an earthquake, so medical facilities need to take measures to, secure heavy medical equipment or any objects that could fall and injure patients and staff. Securing items that could fall, slide or topple during an earthquake will greatly reduce damage and its consequences. Studies have shown that the cost of components (equipment, furniture, partition walls) relative to the entire building cost is much higher for hospitals than for other buildings, mainly due to expensive medical equipment such as scanning and imaging machines. Preventing damage to medical equipment can greatly reduce the financial loss from earthquakes. Conducting a “Hazard Hunt” at your facility be can help in determining what might fall during an earthquake. 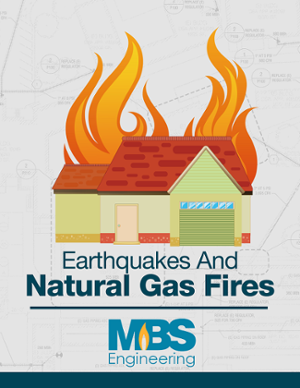 Did you know natural gas contributes to one of four fires after an earthquake? The distribution systems for building utilities such as electricity, water, medical gases, cool air, steam, or telecommunications are vulnerable to earthquake damage. Leaks from gas pipes can be a fire hazard. If your medical facility is located near natural gas pipelines, make sure to hire a professional to install seismic shut-off valves in order to prevent a gas explosion caused by an earthquake. Damage to telecommunication lines can shut down communication systems. It is likely that communications will be interrupted after an earthquake. Cell phones will also stop working due to fallen towers. Evacuations might be necessary, making it difficult to keep records of patients and their conditions. Damage to roads and bridges might make it especially difficult for emergency responders and relief supplies to reach the hospital as well. Make sure to get an immediate assessment of structural and non-structural damage post-earthquake. Damage to non-structural equipment can lead to a slowdown or halt of services (diagnostic equipment becomes inoperable or hallways become inaccessible). Have an MBS Engineering natural gas expert inspect the property for a gas leak due to the earthquake. Although the building may be structurally sound, an earthquake may lead to reduced operations due to preventable damage. The level of a facility's preparedness will determine how severe the consequences of an earthquake will be. Prepared hospitals with reduced damage and backup power will keep most medical equipment functioning; prepared employees will remain calm and know how to react. Unprepared facilities will be in crisis rather than responding to the needs of the community. Hospitals need to stay open at the community’s time of greatest need. When a they are rendered inoperative during a disaster, the loss of emergency services makes it more difficult to save lives. Seismic protection is a must to prevent structural damage and secondary disasters such as fires and floods.